Mexico is one of the world’s “Top Ten” countries for vehicle production and for vehicle exports. 75% of Mexico’s annual production of around 2 million vehicles are made for export. The industry attracts large amounts of Foreign Direct Investment (FDI). Vehicle assembly plants provide around 60,000 jobs, with a further 80,000 employed in distributorships nationwide and a whopping 420,000 employed in the autoparts sector. The combined exports of vehicles and autoparts bring 85 billion dollars a year into the Mexican economy. 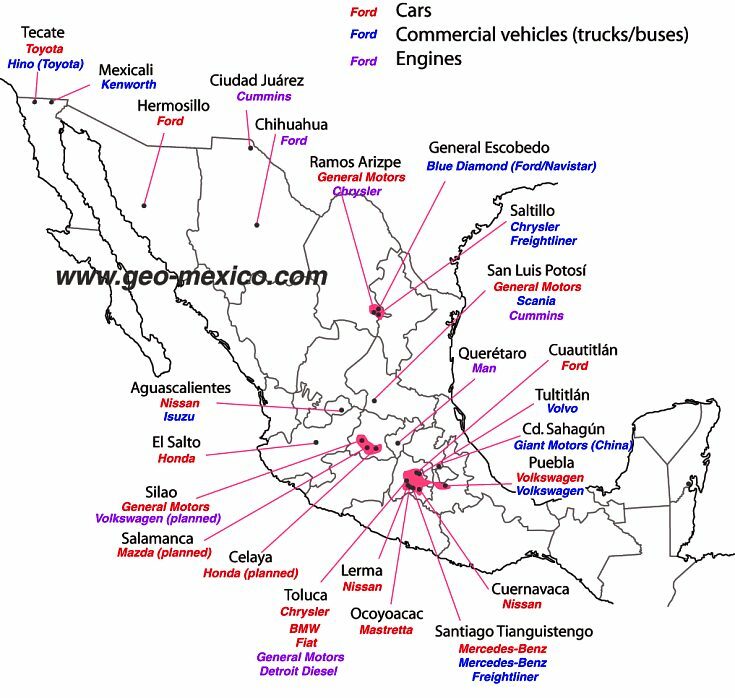 There are more than 25 vehicle assembly plants in Mexico, manufacturing many brands of cars and trucks (see map). In addition, there are 1100 firms specializing in making parts for vehicles. In this post, we consider the location of vehicle assembly plants; in a later post we will look more closely at the characteristics of the vehicle assembly and autoparts industry in Mexico. Vehicle assembly plants in Mexico, 2011. Credit: Tony Burton/Geo-Mexico; all rights reserved. ﻿As the map shows, certain areas of Mexico have attracted more investment in vehicle assembly plants than other areas. The two largest existing concentrations are focused on Toluca in the State of México, and on Saltillo in northern Mexico. However, the fastest growing cluster is in the central state of Guanajuato, where two major plants are currently in the planning stages. 1. What are the advantages and disadvantages of having several vehicle assembly plants in the same area? 2. What the advantages and disadvantages of locating vehicle assembly plants far apart? 3. Vertical linkages occur when one company controls many or all stages in the production of a product. For instance, an auto company may make its own engines and accessories to attach to the vehicles it makes. Horizontal linkages exist where one company is supplied with the components (engines, gearboxes) it needs by another company. What part do you think vertical and horizontal linkages might play when a major automaker decides where to locate a new vehicle assembly plant? 4. Why are there no vehicle assembly plants in southern or eastern Mexico? 5. What are the main reasons for the cluster of vehicle assembly plants near Mexico City and Toluca? 6. Why has Ford chosen to locate its two plants in northern Mexico in different states? Discuss your suggestions with your classmates and teacher. The answers to these questions should give you a useful list of the major factors that explain the distribution of vehicle assembly plants in any country, not just Mexico.